Ed Nelson had only worked for WNAX in Yankton, SD, for a couple years before he was hosting the morning news-and-music show, The Five State Parade, for ‘mid-morning relaxation’. You know that you’re listening to a farmer-focused radio station when 9:10am is ‘mid-morning’. 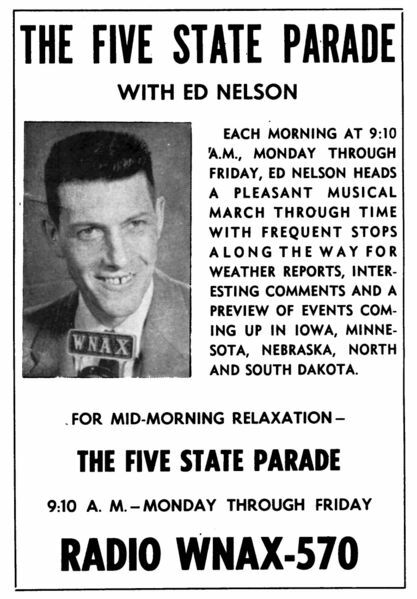 Anyhow, Nelson stays with WNAX for another twenty years or so, retiring in 1988. This entry was posted on Wednesday, November 12th, 2008 at 7:49 am	and is filed under Uncategorized. You can follow any responses to this entry through the RSS 2.0 feed. You can leave a response, or trackback from your own site.